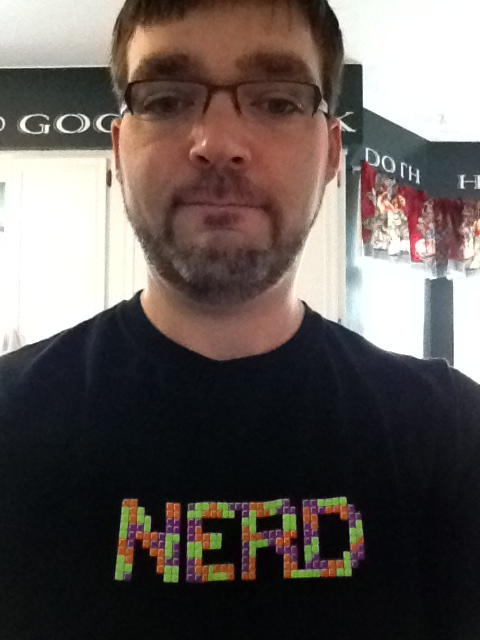 So, as I teased on Tumblr this morning, today was a nerd-filled day. After lunch, Sarah (one of her friends) and I went to see the Hunger Games movie. It was an excellent adaptation of the books (which I enjoyed very much). It strayed very little from the story clearly presented in the novel . . . which is why I find it odd that I liked it so much, considering I find the movie version of Harry Potter and the Sorcerer's Stone at fault for doing the same thing. Still, the movie was well acted, well-shot, and didn't stray away from the grim reality of what the story is really all about. I've not seen Jennifer Lawrence in anything else, but I found her to be a very convincing Katniss. If I had to pick nits, I'd say Lawrence was too emotionally vulnerable in a few spots that Katniss would never have been while being viewed on screen (her character said as much in the book). But I know that, without the benefit of internal monologue, Lawrence went for a human moment. Another change that was a bit surprising, but--again--understandable, was the portrayal of Woody Harrelson's Haymitch. This movie version of the former District 12 victor was not taken directly from the pages of Collin's first novel. Harrelson's Haymitch was more forthright, more willing to help, and far less of a besotted stumblebum. I won't go into details on other stuff that were all smart cinematic adjustments to make a movie more approachable. It was well done and definitely tense when it needed to be tense. I feel certain that a sequel (based on Catching Fire) will be green-lit. But I am, at least for now, less excited about them. The Hunger Games has always been my favorite of the three books. As luck would have it though, we had another nerd-tastic option available to us. So, we sat down and watched the online premiere of Nickelodeon's new Avatar: The Last Airbender sequel--The Legend of Korra. Even though the TV show doesn't premiere until mid April, I knew that the first two episodes were being unlocked this weekend. So I held that in reserve to ensure a special time for Grace and myself. I've found that I need to balance my time with the girls and make sure they are both given special attention from time to time. And especially I should not single one out above the other. So, it was good for me to have these two distinct options that I could turn to for them . . . and for me. As I've said before, they are only going to grow older and progressively away from me--as they rightly should. But . . . for now, the odds are ever in my favor.